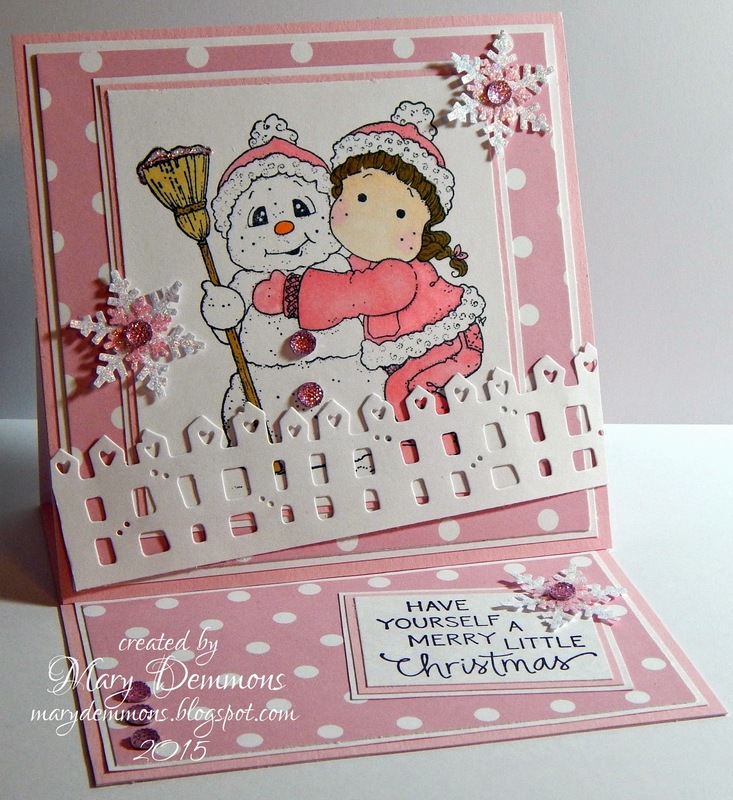 I used Snowy Hug Tilda from Magnolia Stamps to create this easel card. I love snowmen this image has to be one of my most favorite snowman images. For the front of my card I started with a pink 5x5 card base. I added a piece of pink and white dot patterned card stock that I backed in white card stock. I colored the image using Spectrum Noir pens and backed it in pink and white card stock. My fence is Magnolia Lovely Fence Doohickey Die cut out of white card stock. I just love the little hearts that run along the tops of the fence posts. I decided to add the fence at an angle to the bottom front of the card. Then I punched 2 snowflakes from white card stock and 2 smaller snowflakes from pink card stock. I layered the snowflakes, added a pink gem to the center of each and added one to the upper corner of the image and the other just above the fence on the opposite side of the image. I also added 2 pink gems to the snowman for buttons. 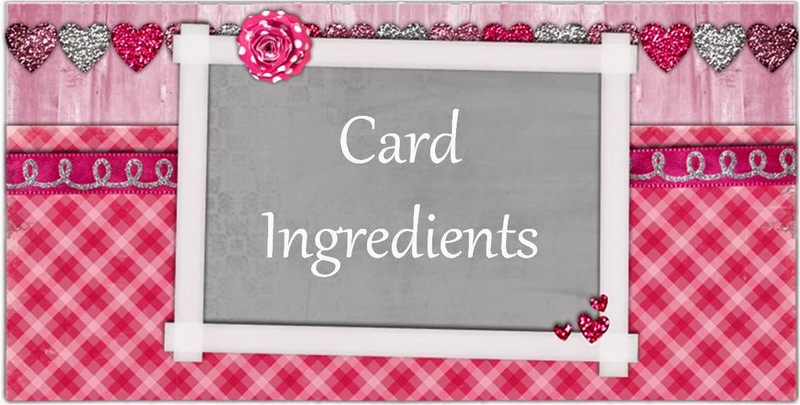 For the inside of my card I again started with a pink card base. I added a smaller piece of pink and white dot patterned card stock backed in white card stock to the bottom half of the inside. I stamped the sentiment on white card stock and backed it in pink and white card stock. I punched another snowflake out of white card stock and a smaller snowflake from pink card stock. I layered them and added a pink gem to the center and added it to the corner of my sentiment. I added 3 more pink gems to the bottom corner of the inside of my card. I added diamond stickles to the snowflakes and to the snow on the snowman's broom. Shabby Tea Room: Forecast Freezin! Another fabulous card, Mary. Love the easel shape and cute stamp! Thanks so much for playing along again in my Monday Morning challenge at My Creative Moments! Super sweet! Thanks for joining in at Daring Cardmakers. Beautiful pink card..love the pretty design, colors and adorable image!! Thank you for joining us at "The Shabby Tea Room for our "Forecast Freez'in" challenge! Darling card, great design and image. Wonderful papers, colors and accents. Thank you for joining us this week at HIMCR. You even have two cute pink hats on your card! Thanks for joining the Daring Cardmakers head gear challenge. It's so sweet! Wonderful choice of color for Christmas! I love design! This is such a sweet card. Love the soft colours you used. Great Christmas scene. Such a sweet image. I love the softness with the white and pinks. That fence die is beautiful. Thanks for sharing with us at Eureka! Stamps Heart Challenge. Hi Mary awww she is a cutuie..lovely take on the chall theme. Great job! thanks for sharing with us at Totally Tilda. This is super cute! Love the pink Christmas. Thanks for joining us this week for the Loves Rubberstamps Challenge! I LOVE snowmen! In fact I collect them and love to display them at Christmas time. Super job on this sweet card. Everything ties together so beautifully. Thanks for joining our challenge at Magnolia-licious™ Challenge Blog. What a lovely creation! Thanks for joining us at TFMC. Your choice of Magnolia's Snowy Hug is spot on! I love the pinks, too! The card is so sweet! The fence is a perfect divider between the top and bottom, too! Good thinking! Thank you for sharing this with us at the Magnolia-licious Challenge Blog! Oh, so sweet!!!! Nice girly colours!!!! Thanks for joining us at the Dream Factory Challenge Blog also with this card!!!! A very cute card. Thanks for joining us at the Dream Factory Challenge. Great card it’s gorgeous and beautiful coloring! Thanks for joining our Hearts Challenge this week at Eureka Stamps. This is so pretty.Just love the die cuts and sentiment to go with this sweet image. OMGosh this is so adorable, I love it! Thanks for playing with us over at Loves Rubberstamps!!! Thank you soo much for taking part in our "Winter” challenge over at Creatalicious & good luck in the draw. Beautiful card and such a cute stamp. Thanks for joining us at The Glory of Christmas. Thank you for joining us at the Dream Factory with this beautiful card.